With the lovely weather we've been having the last few days, I took my palette outdoors and sat down on some stone steps to paint the purple columbine flowers blooming in my garden. While quietly painting, I heard the buzzing of what sounded like a gigantic bee. And there it was, a ruby-throated hummingbird which visits these flowers daily while they are in bloom. 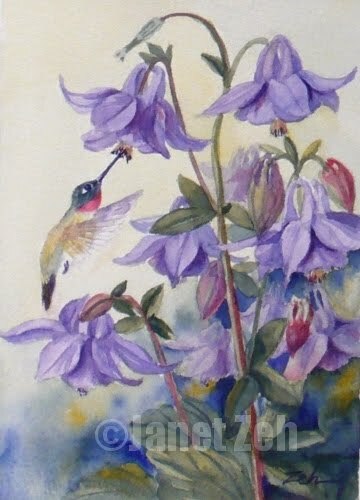 As he flew from flower to flower, I added him to the painting. Perfect! Thanks much! Glad you like it. The rose red mixes to make a nice purple, I agree.